President Donald Trump, New York businessman as President. WASHINGTON, DC — When President Trump this month reached the first anniversary of his tenure as chief executive of the United States, he had hoped to mark the occasion at his Florida resort surrounded by jubilant supporters and financial backers. Instead, Trump marked the occasion holed up here in the White House, avoiding most contact with the public—even by tweet—as the federal government partially shut down after Congress refused for the third time in recent weeks to approve a spending bill to keep the national government running. The inability of Trump to get the Republican controlled Congress to agree on a temporary spending bill came on the heels of the inability of Congressional leaders to get Trump to clarify the conflicting signals he was sending lawmakers regarding his position on controversial proposed legislation for citizenship for thousands of undocumented foreigners living in Tennessee and across America under the DACA program. For sure, Trump’s first anniversary recognition this past weekend was far less than what he or the rest of the country that follows politics had hoped for. At the same time, say historians and political analysts, what America saw at his first anniversary mark was what people should have expected. It is also what America should look for during the rest of Trump’s term, they say. “Modestly successful” is how Vanderbilt history professor Thomas Schwartz characterized Trump’s debut on the national stage. His assessment was similar to others across the spectrum. Trump was able to get a new tax bill adopted by Congress, a measure that offered generous tax breaks to corporations and wealthier citizens and a nominal short term tax cut for most working people. He was able to get his choice of a conservative federal judge confirmed to an appointment to the U.S. Supreme Court, delivering on another promise to his politically conservative base of supporters. To the delight of many his business constituents, President Trump eliminated scores of federal regulations he and his supporters felt went too far in helping protect water, air, forests and roads from pollution and erosion. He announced a roll back of regulations designed to protect consumers from questionable and shady business practices. While delivering for his base of supporters, President Trump has failed as a national leader on a number of fronts, especially when compared to his predecessors be they Republican or Democrat, said Schwartz and others. On the political front, Trump was unable to get Congress to repeal the national health care act, commonly referred to as Obamacare. Repealing the health care law was a 2016 campaign priority for Trump and the Republican Party he took over. He has repeatedly been unable to persuade Congress to allocate billions of dollars to begin work on a border wall along the property lines between the United States and Mexico. He’s not been able to get a full federal budget for fiscal year 2018 that began last October. Meanwhile, educators and health leaders have been unable to motivate Trump to make such bold appeals for funds for education, national opioid crisis and other “non- essential” programs. Using a bully vocabulary and disrespectful language oft times spewed like snake venom, President Trump has “polarized” the country as it has not experienced since the 1950’s and 1960’s, Schwartz and others said. Just as he did on the 2016 campaign trail, Trump has earned a trademark during his first year for demeaning public figures he does not like and or disagrees with like Tennessee Sen. Bob Corker. 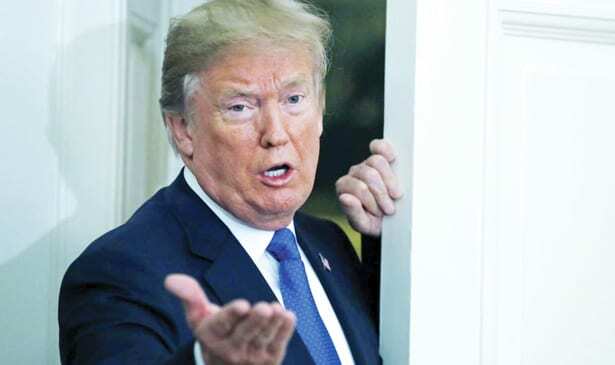 Beyond insulting political leaders around the world with acidic flip references and characterizations, Trump has not been able to derail world trade pacts. Even as he refused to have the U.S. sign a world pact regarding pollution protection and global warming reduction plans, other nations and many American cities ignored his decision and endorsed the agreement asserting it was important. “He’s terrifically unpopular abroad,” said Schwartz, noting that may explain in part why Trump is passing on a previously planned trip to England where American presidents were admired for decades. Trump also has the ongoing Russia investigation hovering over him and top White House aides. For sure, today there are no James Neal or Fred Thompson figures around, the late legal legends who worked on Capitol Hill to help pursue the Watergate investigation that played a role in the resignation of President Richard Nixon, now diseased. Still, the current investigator seems as intense as the Watergate probe. “Trump is his own worst enemy,” said Ed Cromer, a veteran Tennessee political analyst who retired earlier this month as editor of the Tennessee Journal, a publication well respected in Tennessee political circles. Cromer echoed others in asserting Trump, a one-time New York businessman turned politician, “undermines himself” with his biting rhetoric. “There are a lot of negatives” for Trump, comparing the President to recent predecessors including former presidents Obama, Bush, Clinton, Bush, Nixon and Ford, said Schwartz, a historian who focuses on presidents. “He still lacks the gravitas of what it means to be President” of the United States. “He loves being the center of attention,” said Schwartz. As for the future, political analysts say they expect President Trump to stay the course for his remaining three years and speculate he will run for re-election in 2020, absent major setbacks on the political front or the federal investigation into suspected Russian involvement in the 2016 contest for President. Trump still has a solid, albeit small, base of Tennessee supporters who helped him win the 2016 race for President. Those who track Tennessee politics for a living note this year’s race for Governor and U.S. Senator replacing Sen. Bob Corker are at present a tossup, with certain conditions. If Trump is still “at the center” of everything by election time, is could hurt Republicans chances this fall, observed Schwartz. Otherwise, voters can expect three more years of the same basic approach.